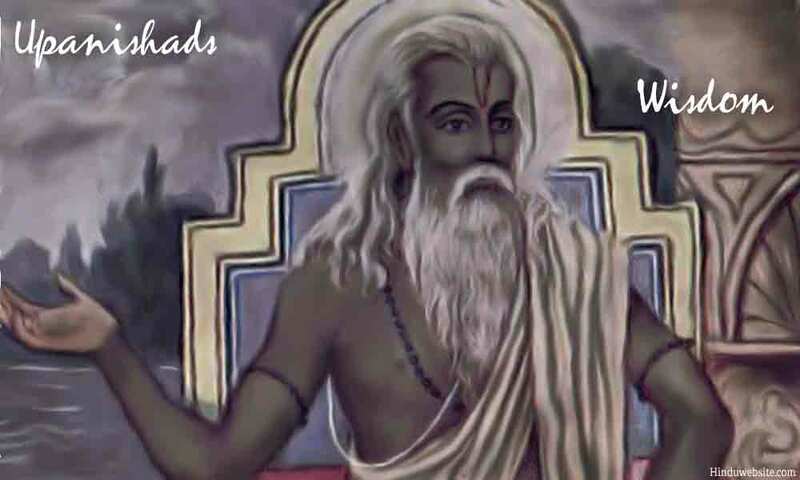 The Isa Upanishad or Isavasya Upanishad is found in the 40th chapter of the Vajasaneya Samhita of the Yajurveda. Isa means the Lord of the Universe and vasya means enveloped or covered. The Upanishad is about God and our roles and responsibilities in ensuring order and regularity of the world and our own liberation in the end. The Upanishad explains very briefly, why human beings should live responsibly doing their duties, without pursuing wrong methods of knowledge and worship, so that they can attain liberation by going to the immortal world of Brahman. Good deeds are important. Truthfulness is important. One must perform all the ordained duties assigned by God to realize the four aims of human life and do justification for one's birth and existence in the world owned by God. Although the Upanishad has only 18 verses, they sum up the essential beliefs and practices of Hinduism. In fact, spiritually and for the purpose of leading a divine centered life, the 18 verses are as important as the 18 chapters of the Bhagavadgita. Mahatma Gandhi found the first verse of the Upanishad profoundly appealing as he felt that it contained the message of universal brotherhood- not only brotherhood of human beings but of all living things." The Upanishad begins with the majestic and triumphant declaration that the whole universe is divine and sacred because it is inside Brahman and enveloped by Him. The Upanishad contains some important concepts of Hinduism which are also found in the Bhagavadgita. They are explained below. The Bhagavadgita has eighteen chapters and the Isa Upanishad has 18 verses. In many ways, the eighteen verses are as significant as the 18 chapters. In eighteen verses, the Upanishad sums up the significance and purpose of human life and with what attitude one should live here upon earth and depart from their bodies. God is the true owner of and supporter of everything. The whole creation is inhabited and enveloped by God. He is also its supporter and sustainer. Creation is an extension or manifestation of Brahman. According to some it is a super imposition. Whatever may be the nature of creation, the Upanishad affirms that Brahman is the Supreme Lord of the universe and He is responsible for all movements and actions. He has apportioned duties and responsibilities for all beings in creation. The Upanishad also describes the nature of Self and the consequences of indulging in self-destructive actions. The Self is all pervading, faster than the senses and the mind. It is everywhere and present in everyone. Those who indulge in evil actions and harm their spiritual welfare go to the sunless worlds of utter darkness. However those who realize the Self feel no hatred or ill will. Duty must be performed with detachment, without claiming ownership and doership. Ownership and doership arise from attachment. The Isa Upanishad declares that since Brahman is the Lord of the universe, we should not covet the wealth that truly belongs to God and with this thought in our minds we should wish to live here performing actions with detachment. This is the only way to avoid karma and sin even when we perform actions. The third verse of the Upanishad is a direct reference to the yoga of action (karmayoga) and the justification for its practice. One must pursue both ritual knowledge and spiritual knowledge. The Upanishad deals with the yoga of knowledge in verses 9-11. True knowledge consists of both ritual knowledge (avidya) and spiritual knowledge. Both types of knowledge are essential for human beings to perform their obligatory duties. Those who take up householder's life should ignore neither the sacrifices nor spiritual practices. Both are required to fulfill the four aims of human life, namely righteousness, wealth, pleasure and renunciation. Ritual knowledge and sacrifices should be pursued as a student and householder. In the later stages, during retirement and the life of renunciation, one should focus solely upon self-knowledge, abandoning all desires and attachments. Those who pursue either of the two types of knowledge, incur the sin of neglecting their obligatory duties. In the end, they enter the darkest hells. One must worship both manifested and unmanifested aspects of creation. The yoga of devotion is suggested in verses 12-14. Worldly people who take up householder's duties should worship both the manifested and unmanifested aspects of Brahman. This is a continuation of the previous idea. The gods are the manifested aspects of Brahman. They should be worshipped through rituals and sacrifices as part of one's obligation towards them and to maintain order and regularity of the worlds. The Supreme Self and the individual Self are the unmanifested aspects of Brahman because they are eternal and immutable. They should be worshipped internally through meditation, concentration and self-absorption. According to the Upanishad, the householders have an obligation to practice devotion by practicing both methods of worship. If they follow one or the other they will enter the darkest hells. One must lead a dutiful and truthful life to qualify for immortal heaven. The importance of truthfulness and dutifulness (satyadharma drista) are emphasized in verses 15, 17 and 18. These are similar to the divine qualities described in the Bhagavadgita. Only those who perform good deeds and practice their duties sincerely, abiding by truth, are qualified to reach the world of Brahman, travelling by the immortal path. Their journey is facilitated by Agni and made possible by Brahman, addressed in the Upanishad as Pusan, the deity hidden in the golden orb. One must pray to God at the time of death. The verses suggest that one's thoughts must be focused upon Brahman and remain detached from the mind and body. This idea is also emphasized clearly in the Bhagavadgita. The last three verses in the Upanishad are chanted when someone is nearing death. They are meant to facilitate a soul's journey to the world of Brahman through the last obligatory duty, which is sacrifice of the body as an offering to Agni. Detachment from the mind and body are suggested in the verse 17, where the departing soul makes an offering of the elemental body to fire, and requests the mind to remember the good deeds so that its journey to the immortal world is ensured. One must leave the body with good memories. The last three verses also signify the importance of keeping the mind in a positive state. One should remember Brahman constantly and remember all the good deeds performed. There must an aspiration to reach the highest heaven as the culmination of the good life one has led upon earth. The last three verses are in conformity with the declaration made in the Bhagavadgita that whatever a person remembers at the time of his death, that he attains. The three verses therefore urge us to remain positive and stay focused upon Brahman and His world while departing from here. Thus in a very brief and straightforward manner, the Isa Upanishad puts forth some of the most fundamental aspects of Hinduism and sums neatly the importance of acknowledging God as the Lord of the universe, doing our duties, pursuing knowledge, practicing devotion and keeping our minds focused upon God at the time of our departure from this world. The emphasis is upon leading a balanced life, in which we should ignore neither our worldly duties and obligations nor our spiritual welfare. We should make use of the human birth we have attained, which is a rare opportunity, to escape from the cycle of births and deaths. If the Bhagavadgita is the song of God, Isa Upanishad is the teaching of Isa, the Lord of the Universe.